Simon Rodger made his debut for Crystal Palace on August 5, 1991, away to Sheffield Wednesday aged 20. 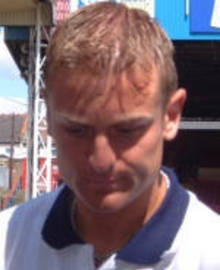 More than a decade later in an injury-plagued career, he has racked up in excess of 300 appearances for the club which makes him the sixth in the all-time list of appearances for the Eagles. Rodger said: "I'm really proud to reach the 300 games. I've enjoyed pulling on that shirt for Crystal Palace over the years and I've had some really happy times at the club. The fans have been great to me. "I've played under quite a few managers during my time here, Steve Coppell, Terry Venables, Alan Smith twice, Dave Bassett and now Steve Bruce. "And I've played alongside some brilliant players as well. I count myself lucky to have had such a long career at this club. "It's not often that players reach these sort of figures now with people moving to other clubs, but I'm really proud to have done it. "Obviously the season we won the First Division Championship was a major high and the play-off final was a day to remember. There have been some brilliant times here and I have never for a second thought about leaving." Rodger has been in and out of the side throughout his Palace days with injuries and was grateful to have recovered from a long-term back problem in 1998. He said: "I had a back operation which put me out for a whole year and that was hard to get back from, but after that I just thought every game was a bonus because at one stage I thought I might not play again. "I've known the 300 has been coming up, but it's not something I've been counting down. "I think the best manager I have played under so far was Steve Coppell, he got us through administration without getting relegated and was a Palace man through and through. "But I also put Steve Bruce highly up there. He knows when to be serious and has played the game at the top level so everyone has the utmost respect for him." Still a Jolly night - cheers for 12 years!